If you want a big screen on a small budget, this is a laptop to consider. An uninspiring display, heft, and input issues can be overcome. The inherent give and take of choosing a new laptop, especially when constrained by a budget, is no fun. With the notebook market increasingly centering around the 13-inch mark, those who need or want a larger display are increasingly getting hung out to dry. With that in mind, the latest entry into Acer's Aspire line of laptops, the E15, is worth taking notice of. It sports a 15.6-inch display, is priced to sell at $469 (about £308, AU$601), and lands with a 15 x 10.1 x 1.2-inch (381 x 257 x 30 mm) (W x D x H) footprint big enough to replace your seatback tray. Armed with a number pad and a touchscreen, the E15 aims to serve the needs of multimedia viewers as well as number crunching office workers. But in order to be even slightly multifaceted at this price, sacrifices were made that have led to drawbacks. When you go big on a budget, it's almost impossible to avoid setbacks. Lenovo's 14-inch Z40 turned out to be an unadvisable purchase even for just $599 (£399, AU $799). 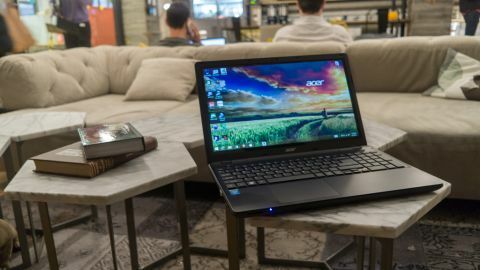 The E15's price, though, may be enough to entice shoppers away from another 15.6-inch laptop from Acer, the Aspire E5, which sells for around $626 (£399, AU $766). For this price, I wasn't expecting anything newsworthy in terms of form. This laptop is big, plasticky and heavy at 5.95 pounds (or 2.69 kg). One of the biggest sins of the E15 is a trackpad that's well below standard. Clicking "no" through a series of set-up windows upon start up was a struggle, as it repeatedly refused to process my clicks. The trackpad is so wide that I experienced a few accidental right-clicks. Also, unfortunately, the E15 will not allow you to turn off tap-to-click. This may not be a problem for you, but it's personal gripe that's always led to accidental clicks for me. The actual keys on the keyboard are decent, with enough feedback to allow for a functional typing experience. The E15's full keyboard will appeal to the spreadsheets crowd, but there is a learning curve, because the keyboard is shifted to the left to make way for the numpad. If you're used to touch typing with your fingers resting on the F and J keys, using the E15 on your lap can be difficult. While I'm used to having my hands rest symmetrically on the width of the notebook's keyboard, this is an awkward proposition with the E15 because your right arm is either stretching across the right side of the computer or the right fifth of the laptop is hanging off your lap. One thing I liked about the design is that there are USB ports (one is 3.0, the others 2.0) located on the left and right sides of the laptop. This makes it very easy to connect a cable on either side and avoid mousing into any tangled wires. While the E15 is marketed as having an HD resolution display, it's still clearly and obviously not as pixel dense as other laptops on the market. For viewing photos and watching video the machine performed admirably, but did not truly impress. No matter which coffee shop I took the the E15 to, I would also have to take some time to make sure I sat somewhere I could avoid getting too much light bounced back into my eyes, thanks to a very glossy screen. Also, while the touchscreen was good and functional, there is still no great case to be made for it. Choosing the E15 also means going without a DVD drive, albeit a sacrifice that most laptops have already made. Those in need of an optical drive should consider the Aspire E5 as price difference between the two models is about $160 (about £105, AU$ 206).